Labor Day weekend already? It seems like it was just Memorial Day weekend!! Well there’s only 3 weeks of summer left. Soon the leaves will change colors and it will be chillly again. I can’t say I’m sad about that. This summer seemed to not be our typical Long Island summer. Too rainy. Too humid. Not many nice days at all. So while I’m usually summer’s biggest fan this year I say ‘bring on the fall’. I’m ready for boots and scarves and sweaters (yay!! get the cashmere out!!). Husband and I finally did some painting in our house that we should’ve done probably 3 years ago-but alas-we put things off like that. It felt really good to get it done and, as always is the case, it looks fabulous. I knew it was going to be an active busy day so I planned ahead and had everything I needed for these sandwiches on hand. They were a HUGE hit! They were so tasty. They’re so tangy from the broth and the sweet onions were deeeeeelicious! And they came together really fast to boot. 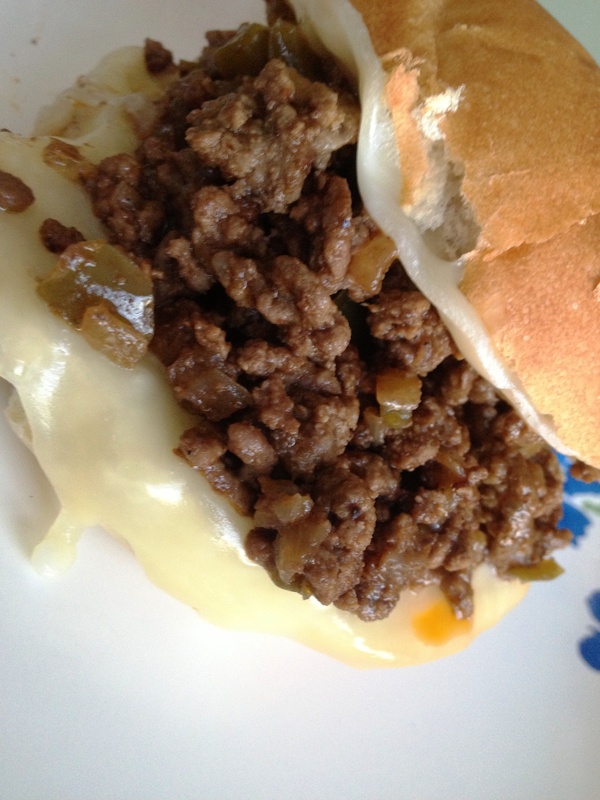 A perfect sandwich for a day of doing things around the house or for a nice lunch at home. By the way-the color in the background of the photo below is Benjamin Moore’s Wood Ash the color we painted the room. It’s very nice if you’re looking for a warm neutral to go with dark furniture/and wood floors like we were. Heat a medium non-stick skillet over med-high heat and add the onion. Spray with cooking spray and sprinkle in 1/2 tsp of the Mrs. Dash. Stir to distribute evenly and sautee about 13 minutes until onion is tender and golden brown. While the onion is cooking add the water 2 tbsp at a time until it evaporates, scraping the bits off of the bottom of the pan with a wooden spoon. Remove from heat and set aside. While the onion is cooking combine the broth and remaining Mrs. Dash in a sauce pan large enough to hold the liquid and the roast beef and stir it. Cook the broth until hot. Remove the pan from the heat and add the roast beef, pushing it down into the broth and let it stand while you prepare the rolls. Place the bread cut side up in the toaster oven, top one side (or each if you prefer) with a slice of cheese. Toast to desired crispy/meltyness. Using tongs pick up some of the beef and let the broth drip back into the pan. Place the beef on the bottom of the prepared roll and top with onions. Serve immediately with a side of broth if desired. 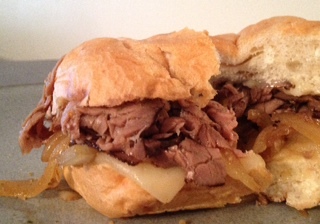 I opted to just drizzle a little broth over the onion/beef on my sandwich and then put the top of the roll on top. Adapted from Cooking Light’s Fresh Food Fast cookbook. I like Falafel. I rarely have it but I do like it. When I came across this recipe I was pretty excited to make it at home. Since I also had these pickled red onions in my fridge at home I knew it was going to be delicious. 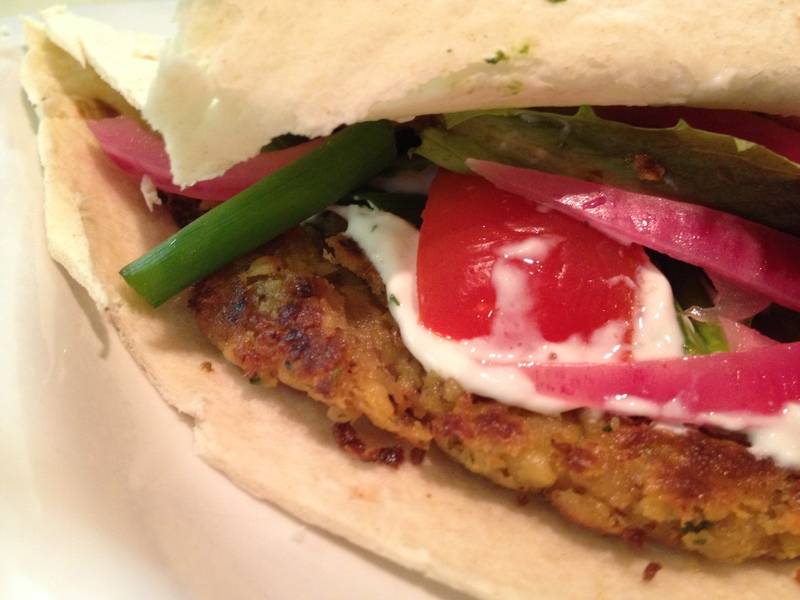 The falafel were so easy to make. I used my small food processor and it just fit-but it worked. These had great texture and you can go either way with the herbs and spices-more or less. They cook fast too. Crispy on the outside and tender on the inside. I should’ve put them on a pita bread but I didn’t have pitas and didn’t want to buy a whole pack for 2 falafel patties. So I used burritos. They worked great! I also made up the yogurt sauce to go on top. Recipe below. Place chick peas in the food processor along with the onion, garlic, parsley, spices, flour and a little salt. Blend until fairly smooth, then shape into two to four (your preference) patties with your hands. Heat the oil in a non-stick frying pan, add the burgers, then quickly fry for 3 mins on each side until lightly golden. This is to my taste. If you don’t like dill or raw garlic change it up. Mash the garlic and salt together to form a paste. Add it along with everything else to the yogurt and stir. 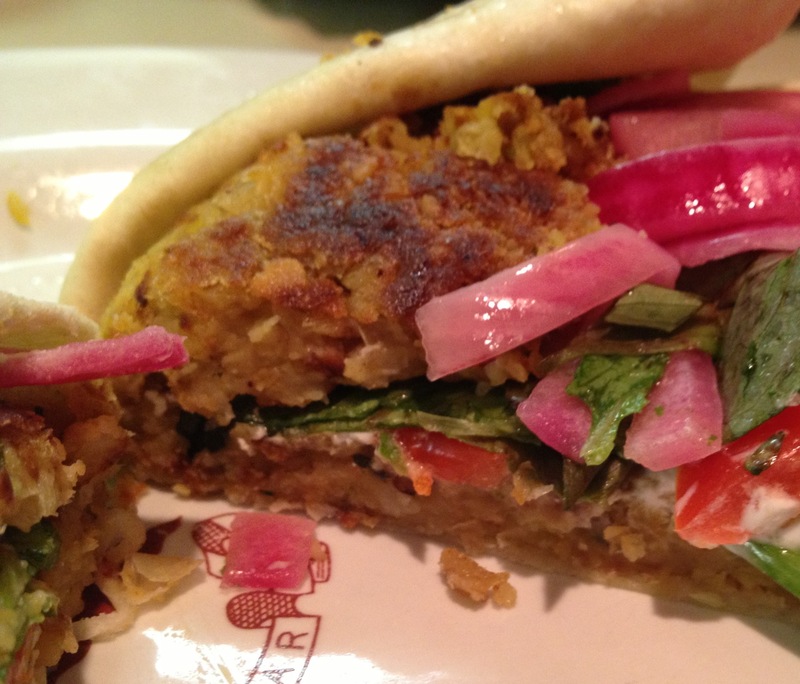 Schmear it on the falafel. 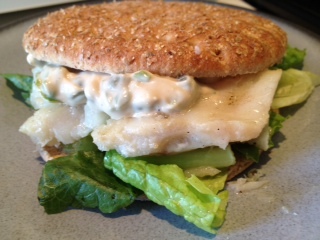 A super-delicious, cool, light, yummy sandwich!! These are SO easy to make and even easier to eat! My husband and I both loved them. The cornichons (gerkins) add a nice bit of sweet/tangyness, the mustard adds just a bit of spice and depth. There is a very small amount of mayo to hold it all together-only 3 tbsp for 1 pound of shrimp. I served mine with chips and kosher dill pickle spears. 1. In a large bowl, whisk together the mayonnaise mustard, brine and 1/4 tsp pepper. 2. Add the shrimp, cornichons and tarragon and toss to combine. 3. 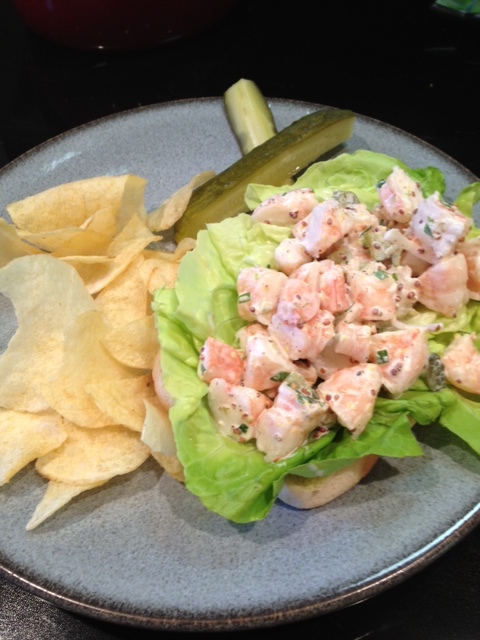 Line the buns with the lettuce and top with the shrimp mixture. Serve with chips, if desired.